One of the classic moments from the James Bond films takes place in the first few minutes of 1964’s Goldfinger. Having wiggled out of his wet suit, Sean Connery steps into a smoky Latin nightclub where he flicks his cigarette lighter to check the time on his wristwatch. The time is important because Bond has set a bomb to blow up a hidden heroin lab. The watch is important, too. It is a Rolex Submariner 6538. Let’s just dispense with the model numbers, shall we? All you really need to say is Submariner to win that instant look of recognition and envy that’s half the reason people drop $8,550 on a wristwatch anyway. Not that that’s such a jaw-dropping price. In this age of status watches, it’s easy to find timepieces that cost more than a house. But dollar for dollar, those in search of status, style, form and function simply cannot do better than a Submariner. As its name suggests, it’s a diver’s watch, guaranteed waterproof to 330 meters (1,000 feet). But as its long list of celebrity fans suggest, the watch is just as famous on dry land. Here’s how that happened. In 1953, French Navy diver Jacques Cousteau wrote The Silent World, a book that chronicled his undersea explorations. The book, and the Academy Award-winning documentary film that followed, captured the world’s imagination and created a generation of recreational divers. 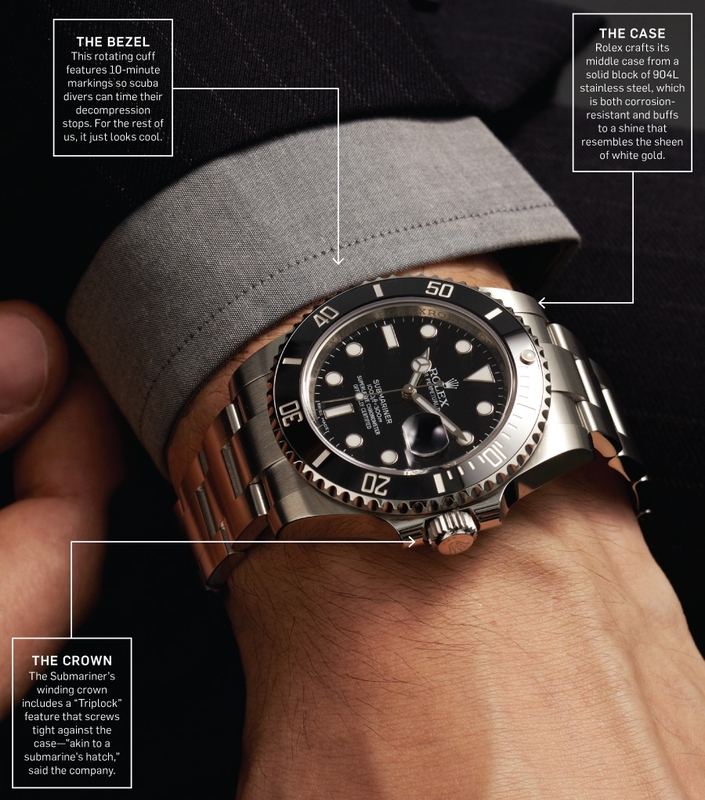 Rolex responded with the Submariner. The wristwatch might never have left the lockers of naval cadets were it not for the Bond franchise. The first four films all featured a Submariner on the wrist of our hero. And, as with so much else, an official anointing by Hollywood was all it took for the brand to hit the big time. From early fans like Steve McQueen and Robert Redford, the Submariner’s following has grown to include Adam Levine, Sharon Stone and plenty of ordinary mortals. That and James Bond. And just for the record, Daniel Craig wears a Submariner, too.